No. Not El Watan the Algerian French-language newspaper, but Homeland (el watan, or وطن, in Arabic) the US television series currently screening on Britain's Channel 4. 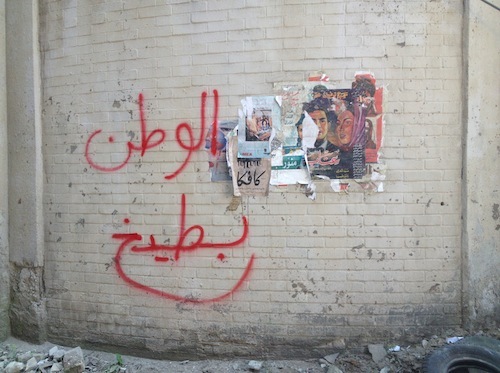 On 21 October, FT language columnist Michael Skapinker published How to avoid ‘Homeland’-style translation tricksters based on a longer piece with photographs and explanations entitled “ARABIAN STREET ARTISTS” BOMB HOMELAND: WHY WE HACKED AN AWARD-WINNING SERIES. Skapinker begins by informing us that the FT has a standing procedure to check photographs the newspaper plans to run that involves (a) locating people who can reliably translate any written messages, and (b) answer the question: Do protesters’ banners or background graffiti include any obscene or embarrassing words? The makers of Homeland, the US television series, failed to take this precaution. In a 2010 paper, Myanna Dellinger of the University of South Dakota law school told the story of a Danish construction company that had won the contract to build the Manhattan offices of an investment bank. An instruction in Danish that the walls should be a graphite colour was translated as “graffiti-painted walls”. What had the Indian delegation proposed — the amendments or the draft resolution? Because one is plural and the other singular, it would have been clear in French, and he thought a native speaker would have written it to avoid the ambiguity in English. Google Translate is improving, but it is still not good enough for business use. ... companies should deal with experts — people who have something to lose if they get things wrong. Homeland’s translators had nothing to lose. Indeed, their trickery has won them plenty of admirers. The series has garnered the reputation of being the most bigoted show on television for its inaccurate, undifferentiated and highly biased depiction of Arabs, Pakistanis, and Afghans, as well as its gross misrepresentations of the cities of Beirut, Islamabad- and the so-called Muslim world in general. For four seasons, and entering its fifth, “Homeland” has maintained the dichotomy of the photogenic, mainly white, mostly American protector versus the evil and backwards Muslim threat. The Washington Post reacts to the racist horror of their season four promotional poster by describing it as “white Red Riding Hood lost in a forest of faceless Muslim wolves”. In this forest, Red Riding Hood is permitted to display many shades of grey – bribery, drone strikes, torture, and covert assassination- to achieve her targets. She points her weapon of choice at the monochrome bad guys, who do all the things that the good guys do, but with nefarious intent. Homeland is watermelon (al watan bateekh) ('watermelon' is often used to indicate that something is a sham or not to be taken seriously) (photos courtesy of the artists). The more I think about it, the more I appreciate and support the taggers' initiative​. And — having just read Outside the Whale by Salman Rushdie after it was brought to my attention in timely fashion by today's The Browser — I am more convinced than ever of what is now my last sentence but one for today.